Things that we find aesthetically pleasing, like a beautiful piece of music or a captivating landscape on canvas, tend to draw us in. Taking an active role in creative pursuits can offer much fulfillment for our lives. Since prehistoric times, when early man painted on cave walls, people have been leaving their mark through art, music and other mediums. In fact, the modern medical community has conducted several studies to better understand our attraction to creativity. It turns out that creativity can actually be good for our health. From boosting brain power to improving memory and increasing feelings of fulfilment, being creative can work wonders on overall well-being. We can’t change the fact that our bodies and brains age as we get older, but we can take preventative steps to slow the process. 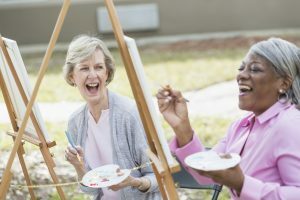 Creative activities, like making a new piece of pottery or painting a picture, improve the communication between different parts of the brain and slows cognitive deterioration. Participating in an artistic endeavor also exercises the temporal lobes in the brain, which is the part that is responsible for memories. This form of exercise can help boost memory, and can be very beneficial for people struggling with forms of dementia such as Alzheimer’s. Many people battle depression and anxiety, and sadly these conditions can wreak havoc on overall health and well-being and even impact immune system function. Simple creative pursuits, like singing a favorite tune or visiting an art gallery, can act as mood boosters. Studies show that being creative can help with the management of emotional pain and depression and offer something called “psychological resilience”, which helps people cope with life’s emotional challenges. Patients battling illnesses or chronic pain have been shown to benefit significantly from participating in creative activities. It may be that these activities serve as a distraction and help reduce the side effects of stress by lowering blood pressure and heart rate, all of which can all have a positive impact on general health. Having a healthy and vibrant social life is one of the keys to feeling fulfilled and maintaining overall well-being. Building and fostering relationships helps slow cognitive deterioration and improves memory. A creative pursuit can help alleviate feelings of isolation, loneliness and depression, and can also present an opportunity to connect and bond with others who share similar interests. At Lighthouse Senior Living, we believe that a creative environment enables residents to thrive and build quality relationships. As an example, our annual Ageless Art Exhibit celebrates the many ways we can all create at every age. Contact us to find out more about our senior living communities in Ellicott City and Middle River and how we help foster creativity.